Over the past few months I've produced several interesting vinegars by different methods, so I thought I'd tell you about them. From right to left (OK, I know it's unconventional, but I didn't think to arrange them in the order I want to talk about them), we have fir cone, blackberry, rosehip, and cider vinegars. Fir cone vinegar: This one isn't so much a produced vinegar, as an existing vinegar with flavour added. I had some clear pickling vinegar, previously used to pickle eggs, and some impulsively foraged fir cones. I put one in the other and left for several months. When first strained, it was a dramatic black colour, but after a few more months, all the black has settled out so I decanted the vinegar into another bottle and as you can see, it's an entirely not-dramatic shade of light brown. It's possible that some of the flavour settled out in the black, but there's still enough left to make a distinctively flavoured vinegar. I used some in a vinaigrette for a tuna and pasta salad I had for lunch today - it was pretty good. Blackberry vinegar: Again, this includes an existing - cider - vinegar but also has quite a lot of acidity from the blackberry juice, so I consider this a bit more of a produced vinegar than the last one. I followed Atomic shrimp's method for making a balsamic-like vinegar. It's not exactly like, but quite similar and very nice. Rosehip vinegar: This one was an accident. I'd made rosehip syrup and found out what a nice drink that makes when diluted, then Ian suggested that it might be even nicer if it was fizzy. I wondered whether I could make something similar to elderflower champagne, so I gave it a go, aiming for the same kind of light, sweet, fizzy drink. Unfortunately, I neglected it in the brewing bucket and it started to sour. That is, it got infected with acetobacter - vinegar making bacteria - and turned into vinegar. This is actual wild fermentation, albeit unintentional. Although I didn't actually want a gallon of rosehip vinegar, it's pretty good stuff and I'm using quite a lot of it in cooking. It isn't very strong, so I might reduce it at some point, but in the meantime I'm just using it in large quantities. Cider vinegar: Finally, a vinegar I made deliberately. I don't have much use for cooking apples as Ian doesn't like stewed apple, and we got given quite a lot of them last autumn. I bottled a fair quantity of apple sauce (still not sure what I'm going to do with it) but decided to try juicing some for vinegar. I didn't bash the pieces of apple enough before pressing, so pressing was very hard work, but eventually I managed to extract about a pint of juice. I then added some yeast to ferment the sugar to alcohol, but I think I caught wild acetobacter again (I can't remember whether I dosed it with a little live vinegar or not). 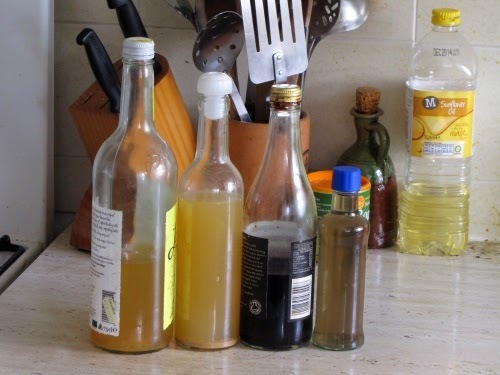 The result is a very good vinegar - strong and with a much more complex flavour than commercial vinegar, even the good stuff. All in all, I'm very pleased with my selection of vinegars and I'm using them in cooking much more than I used to (and correspondingly less lemon juice and wine). Given the quantity of rosehip vinegar I have, I probably won't need to make any more of that for about a decade. On the other hand, the blackberry balsamic is definitely one I'll be making more of, and probably the cider vinegar, too. I had wanted to get my potatoes in the ground yesterday. Perhaps it's just as well I didn't manage it. This fell very loudly last night, so I guess it's actually hail, not snow. It was bindweed roots that slowed me down yesterday, so I didn't finish digging, and move onto planting spuds. It's not often I'm glad of bindweed! 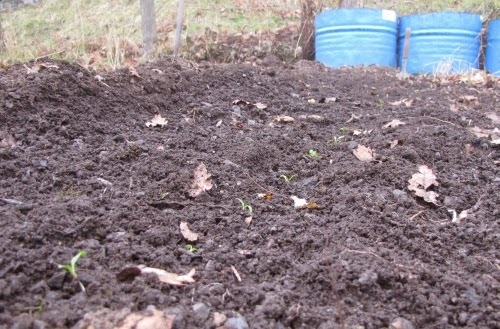 I finally got round to weeding and fertilizing the third and last asparagus bed this week. I should have done it in the autumn, but I reckon it's probably better late than never. One notable feature of asparagus is its deep roots, so fertilizer applied to the surface will take ages to get deep enough to make any difference, anyway. Season of application probably isn't critical. There's nothing to show for this at this stage, just a muddy looking strip with fewer weeds than the surrounding garden, so you'll have to make do with a photo of a tiny asparagus spear, taken in May 2012. Asparagus is a perennial vegetable, usually grown from crowns, which are one-year-old plants that look like a spidery mass of roots. Having planted some of these in the garden of my previous house, I noticed that one of the plants had produced berries shortly before we moved house. I picked the berries and saved seeds from them to plant in the garden here. Even when grown from crowns, it takes two to three years before asparagus is strong enough to harvest (some sources say that a limited harvest may be taken in the second year, others advise leaving it entirely alone until the third year). 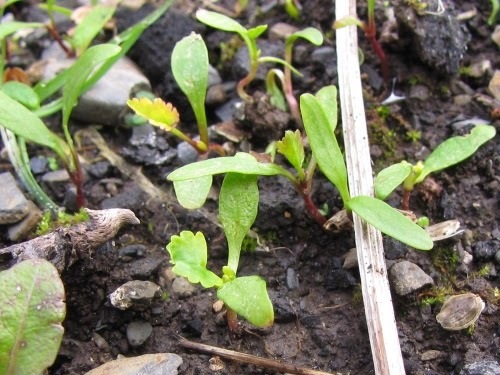 Harvesting involves cutting all the young shoots back to ground level, so the plant needs to be strong enough to put out new shoots and continue growing, several times, for as long as harvesting continues. It's essential to stop at some point - traditionally midsummer - to allow the plant to get on and do its thing. Having sown from seed, this presumably adds a year to the time before I can start harvesting, so from sowing in 2011, it should be ready for a light harvest either this year or next. Last year's spears were a little thicker than the one pictured, but not much, so I'm not optimistic they'll be ready to harvest this year. I'll let you know. Planting out two more rows parsnip seedlings - gosh, this is fiddly! Unexpected potatoes. They get less unexpected each time one surfaces. Wild garlic - it's only just big enough to pick here. We're a few weeks behind other foraging spots I've heard about, even some quite local ones. Cultivated plants challenge summary page here. We've had a week of glorious sunny weather (ending abruptly late this morning. We're back in the clouds now.) which made it a pleasure to get out into the garden. 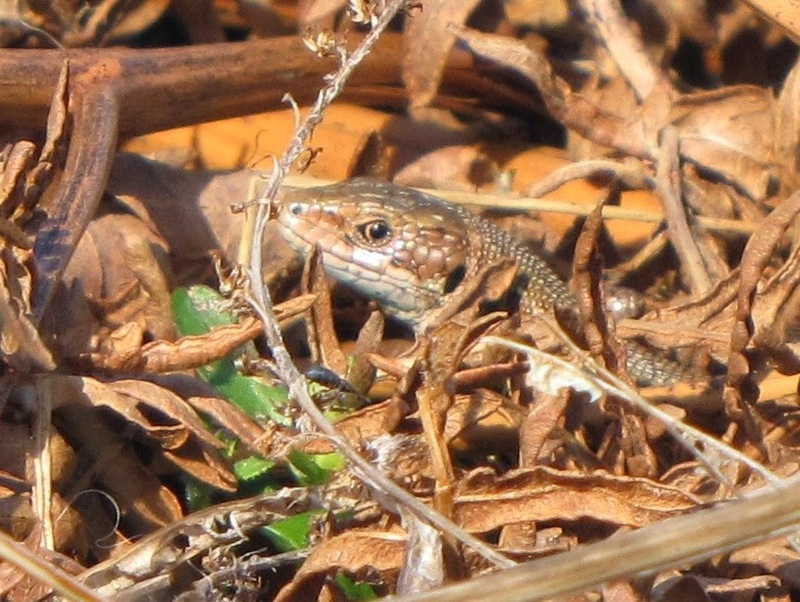 ... and the lizards came out to enjoy the sunshine. In veg bed A, I noticed some seedlings. Are they...? I'd left a few parsnips to flower and set seed in this area, so it wasn't a great surprise to see parsnip seedlings coming up here. Having seen them, it seemed like a good idea to use these seedlings rather than start from scratch with germinating more seeds. I carefully lifted some of the seedlings and laid them between layers of soil in a seed tray. Most of them are still there, but I have planted out one row in veg bed C.
This row is flanked by shallots and garlic, though you can't see those yet as they're under the surface. I'd like four rows of parsnips altogether, so there's a bit more work to do yet. Sowing seeds of sugar beet, Welsh onions, strawberries, tomatoes and potatoes in the greenhouse. The latter three are in the heated propagator and I'm sure I must have cooked them by now. I'll have to wait a bit longer before I give up on them, though. Here's a photo from last week of the nice, clean greenhouse, before I started getting it dirty again. I also fixed up a couple of wires to hang strings from for supporting tomatoes. Unexpected potatoes. They get less unexpected each time I find another one. 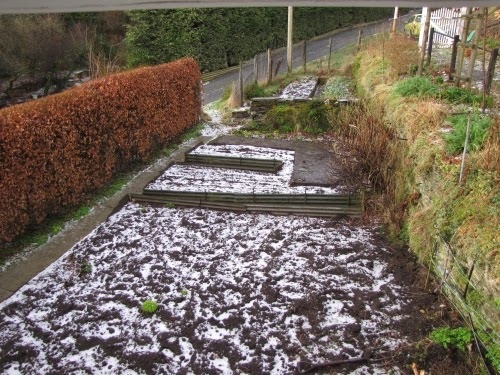 I wouldn't have thought that such a thing was possible, but here we are in mid March, I have lots of parsnips still in the ground and they're all growing like crazy. At least, that was the situation a few days ago. 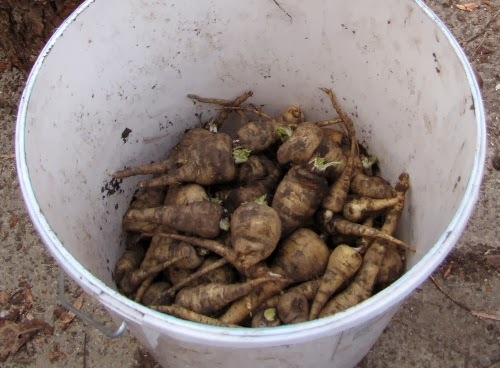 Growing parsnips are not going to store for long, even if I lift them all and try various tricks I've read about, such as removing all the little roots, cutting the tops off and dipping the cut ends in wood ash (gives you a couple of weeks' storage, apparently). I needed to do something with these. I enjoy my home-brewing, but it bothers me a little that the main ingredient - sugar - is not something I've produced myself. What I'm doing is essentially buying sugar (either refined white or malt extract) to ferment, then adding foraged flavourings. However, parsnips are quite sweet and I've heard that parsnip wine can be pretty good. I wondered whether I might be able to brew a drink purely from the sugars in parsnips. Estimates for the sugar concentration in parsnips range from 5% to 10% and I could reasonably hope they'd be at the upper end of that at this time of year. On the other hand, I probably wouldn't be able to extract it all, so that would bring it down a bit. A rule of thumb for potential alcohol content is that 1 lb of sugar gives 1% of alcohol in a 5 (UK) gallon batch. For my 3 lb parsnips, an upper estimate would be almost a third of a pound of sugar, so in one gallon that would be 5/3... about 1 ½%. You're not going to get drunk on that, but maybe enough to be worth a go. I subsequently found more parsnips - several monsters that I'd allowed to run to see last summer - which doubled the quantity, so I could be looking at up to about 3%. That would be good, but is probably very optimistic, given the likely inefficiency of extraction. I looked up various sources of information on how to process the parsnips. Wine recipes recommended cooking fairly briefly, so the veg doesn't start to disintegrate and distribute tiny particles of parsnip throughout the liquid. Descriptions of how sugar beet is processed include finely chopped beet being passed through hot water... hm, hot doesn't sound like boiling, I wonder whether heating at a lower temperature might be the answer? I sliced my parsnips fairly thinly, covered with water and brought to the boil, then reduced the heat to barely simmering, which I kept it at for about an hour. Sure enough, the parsnips were in no state to mash at the end of it, and the liquid tasted distinctly sweet. I strained the liquid off, hung the veg up in a jelly bag, then decided that was a waste of time and put it in the press instead. The strained liquid was about half a gallon, and I got another 2 ½ pints from the pressing, which I then brought back to the boil to sterilize (easier than sterilizing the press), which probably evaporated some off, so about ¾ gallon in total. There were a few things I did for flavouring. First, I put a few of the parsnip slices in the oven and dry roasted them to caramelize some of the sugars, then added these to the pan. Secondly, I took another ingredient that makes a popular foragers' ale - nettles - and boiled up some of those separately. This allowed me to check whether the flavours work together (they do) before adding the nettle tea to the parsnip liquor. Nettles are only just appearing here, so I didn't get very many - about half a colander full. A few more would probably be better. Ginger is often added to nettle ale, and parsnip seeds, of which I have many, have a somewhat similar flavour, so I threw in a teaspoonful of those. I didn't think of that until near the end of processing, so they might have no impact on the flavour at all. When the liquid cooled, I attempted to take a hydrometer reading, which was quite tricky as I don't have a proper flask and it kept sticking to the side of the bottle I was using. I think it read around 2% potential alcohol, which is about what I'd expect from the calculations. I did some gardening last week, but the only plant I really tackled was a buddleia, which I cut back. That's a bit boring for a blog post, so I'm cheating slightly and telling you about some of what I sowed yesterday. In the past I've grown the old favourite variety of broad beans, Aquadulce. I get nice healthy-looking plants, but since living here, haven't had many beans in the pods. Plenty of pods, just a bit short of actual beans. It's probably a lack of insects*, but all the same, I thought I'd try a different variety this year. The beans I've chosen are not strictly broad beans, but the other cultivated variety of vicia faba (I see where the American name - fava beans - comes from now), known as field beans, specifically, Wizard field beans from the Real Seed Catalogue. These have smaller beans than normal broad beans, but in theory there should be lots of them. Clear the bed. This involves surveying the plants that are already growing there and deciding whether I want any of them somewhere else, then moving those that I want and sending the rest to the compost heap. This takes a lot longer than simply composting the lot. Usually in parallel with step 1, remove some of the stones. This isn't really necessary, but I don't particularly want stones in the veg beds whereas I do want stones on the driveway and paths, so I move stones. We're getting onto actual gardening now... run the hand fork or trowel along the bed to make a shallow drill. Spread a thin layer of wood ash in the drill. This serves the dual purpose of making the soil more alkaline (an alternative to lime) and adding potassium, both of which are good for beans. Mainly because I suspect that neat ash might be a bit harsh for baby beans, add a layer of garden compost to cover the ash. Add beans! These are spaced at about nine inches apart (as per instructions on the packet). (Oh no, we're not finished yet) place a holly leaf over each bean. This was my dad's idea for protecting the seeds from hungry mice, and seems to be effective. 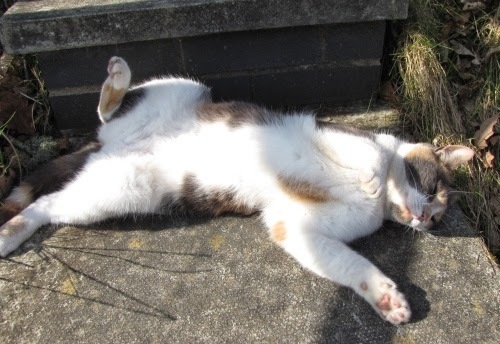 It also helps deter a small cat who sees a freshly sown bed as the ideal place to relieve herself. The downside is that it's time consuming and often painful. Since I don't bury the seeds very deeply, the holly is an ongoing danger when weeding. Cover the holly with the soil that was pushed aside when making the drill. This takes care. This is a pretty slow process, but notwithstanding poorly-setting beans, I seem to do quite well with legumes, so I'm sticking to this way of doing it. This is a very unscientific approach - I could be trying various approaches and taking careful notes to see which works best - but I don't want to risk my crops trying a method that might not work as well. I sowed two rows of beans in bed B1 , near where the gas tank used to be, then a double row of peas plus a few more along the edge in the other half of the bed. These are also from the Real Seed Catalogue and are called, Oskar . Since I grow a lot of peas, I find it tedious putting up supports for them all, so I've chosen a couple of dwarf varieties this year. These will only be a couple of feet tall, and are an early variety. * According to a discussion on Daughter of the Soil's blog, it may be that the bees have found are shortcut; they might be chewing into the base of the flower and bypassing the pollen entirely. Sneaky bees! And there it was, gone! I'd like to say this was remarkable efficiency on the part of Flogas, but in fact it was a coincidence. They'd sent someone out to inspect the old tank last autumn, the result of which was a decision to replace it. Naturally, they didn't tell me this, just turned up with the new tank. As luck would have it, this was less than a week after the gas had run out and I'd disconnected the old tank with a hacksaw. I persuaded the nice men to take away the old tank without leaving a new one behind. The gauge on our huge gas tank has been in the red for a while, and when it suddenly dropped to zero we knew we wouldn't get much more out of it. This is a good thing, because we want rid of it. We no longer use gas for our central heating, just the cooker and one fire, and the tank is an ugly great thing taking up valuable space. We have a plan for replacing it with a much smaller bottle, and a couple of weeks ago, I implemented the first step of that plan, making a base for the bottle to stand on. On Friday evening, I went to light the cooker and no gas came out. My immediate response was to dig out the camping stove to cook dinner, but it was definitely time to move onto the next stage of the plan. Unfortunately, I wasn't entirely sure what that was. The gas bottle has a regulator attached, and I'd checked that this supplies the same pressure as the one on the big tank. Good - no need to buy a regulator, then. However, the output of this device is a nozzle suitable for a rubber hose, whereas the gas goes into my house through a large copper pipe. I wasn't at all sure whether it would be possible to marry these two up, and internet searches were not encouraging. I called a friend. 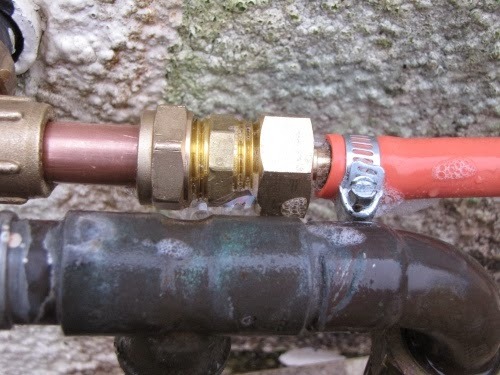 Luckily, my friend Jasper knows about things like this, and assured me that not only is it possible to join rubber piping to copper, but there's an adapter specifically for the purpose that should be quite easily available. I headed into town - the first shop I went to didn't sell gas fittings, but recommended another shop, which did. Unfortunately I'd failed to check the size of the copper pipe in question, and it turned out to be much larger than standard, so I had to go out again this morning to buy an adapter. Since these all came with compression fittings (as opposed to solder) I felt reasonably confident in tackling the job myself. I haven't soldered before and have no intention of starting by pointing a blow torch at a gas pipe! With advice and loan of tools from Jasper (I did try cutting a bit of pipe with a hacksaw. This is a bad idea.) 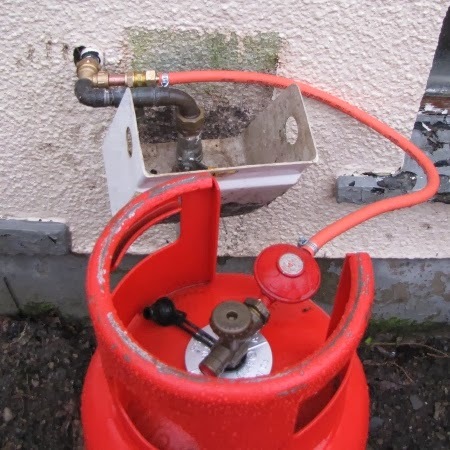 and more advice from the internet, I connected up the various bits of plumbing until I had a gas bottle connected to my house. The gas bottle came free with a second hand cooker. We had to pay for the gas in it. It would have been easier without the old stuff in the way, but I'm not sure whether that belongs to the gas supplier, and is therefore part of the plumbing that I'm absolutely not allowed to touch. At this point, the rain got heavier, so I went indoors to test from there. 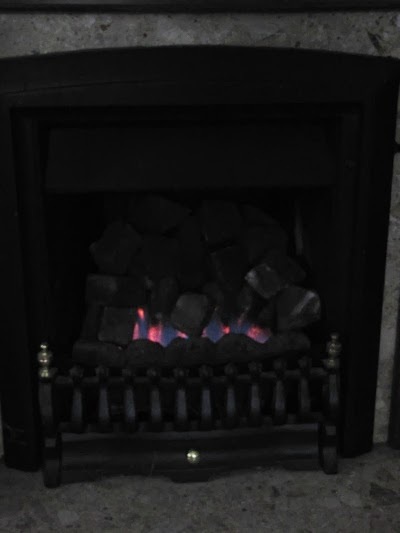 Not the prettiest gas fire, but a more visible demonstration than the oven. Hooray, it works! I had no idea whether my plumbing was leaking, at this stage, but if it was I was just losing gas fairly harmlessly outdoors. When the rain eased a bit, I went out with soapy water to check. Ah, yes, that is blowing bubbles there. Once I'd worked out which joint was leaking, I realised that it was the only one of a different type, i.e. the seal on this one is made by the screw thread itself. That'll need a bit of Jasper's PTFE tape, then (I have some, but not gas pipe grade). 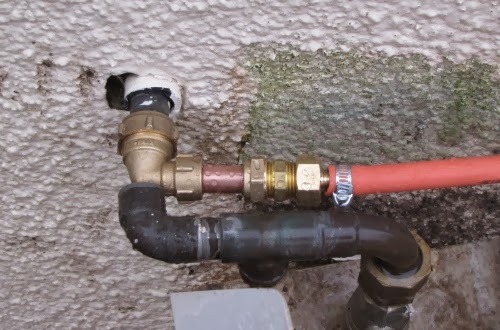 This was irritating, because I should have spotted it before I put it together, and it meant pulling the rubber hose off the regulator to unscrew the fitting. Still, it wasn't too big a job. I did it, and it seems to be fine now. The one remaining task is to write to the supplier asking them to remove the big tank. They're going to want money for that job. At our last house, we had a magnificent lavender bush. I could just about reach from one side of it to the other and it took the best part of a day to tidy it up once a year. Before we moved here, in the autumn of 2010, I took a dozen or so heel cuttings , which means pulling a stalk away from the main stem with a little bit of the base, or heel still attached to it. I pushed these stalks into pots of gritty soil, brought them to Wales, and left them sitting in the conservatory, mostly neglected, over winter. 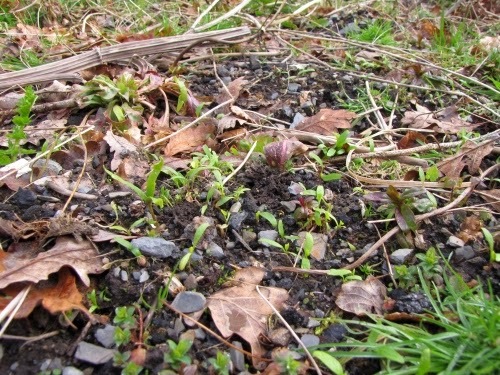 Somewhat to my surprise, by the following spring these twigs had acquired roots, and I planted them out. Not all survived, but I had a few in pots, in reserve, so the dead ones were replaced. I now have six lavender plants along the pathway, three on either side, and one on the terrace. This week I have been trimming off the dead flower stalks and generally tidying up the plants. I've cut the longest stalks back to encourage a bushier, sturdier growth (does this sound like I know what I'm talking about?) 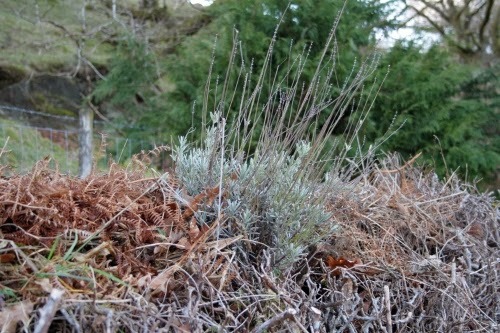 and removed some of the thinnest stalks entirely. Hopefully my seven lavender bushes will thrive, and I'll be able to take more cuttings from them. I'd like more lavender bushes under my fruit trees, and a few more along the edge of the terrace. I don't make much use of these plants, but they're decorative, beloved of bees, and I love the smell, too. A bit of weeding, including clearing around the cherry tree then adding ash and compost. Clearing one of the raised beds; evening primroses went to the kitchen, buttercups, feverfew and bittercress went to the terrace, foxgloves went next to the driveway, in the hope that their roots will help stabilise the ground on the downhill side, stones went into a bucket, and the rest went on the compost heap.